This is quite a scarce, local and possibly declining perennial herb in most of Ireland beyond the Central Plain where it is more frequently met. Despite this it is listed as having been recorded at least once in 33 of the 40 Irish vice-counties (Scannell and Synnott, 1987). Fen bedstraw appears very rare in the north of the island, being confined to a few sites in three counties — Down, Armagh and Fermanagh. In general, fen bedstraw has suffered a widespread decline in the last fifty years in Britain and Ireland through loss or damage of suitable habitat. Galium uliginosum is like a weaker, more slender, scrambling form of G. palustre, Leaves are most often in whorls of six (or eight) around the stem. Despite their slenderness, the stems are rough to the touch (scabrid), possessing minute, projecting papillae, like very tiny prickles (Stace, 1997). These minute projections presumably assist fen bedstraw stems to scramble over neighbouring plants, using them for support in the manner of the very common G. aparine, goosegrass. Fen bedstraw produces small, pure white flowers, only 2mm across, from June to August. Other than straightforward observation, there appears to be little scientific knowledge of the life cycle of fen bedstraw. From its appearance it probably is a fairly short-lived, hardy perennial. It possesses a slender creeping rootstock and weak, scrambling or sprawling stems bearing semi-evergreen linear leaves which require the support of surrounding taller plants to lift their canopy towards the light. Although capable of both vegetative and seed reproduction, the latter is very probably the main method of increase and survival. It does flower quite profusely, the blossom being borne in numerous small panicles in the axils of upper stem leaves, rather than in the large terminal inflorescence of G. palustre. The coumarin scent of the pure white flowers attracts small pollinating insects (Clapham et al., 1962). Seed dispersal is most probably effected by flotatation in water, but transport in mud adhering to passing animals, including waterfowl, may also be significant. Galium palustre is the only species likely to be confused with G. uliginosum. Galium uliginosum can be distinguished from G. palustre by the backwardly directed hairs on the leaf margins (that is, pointing towards the leaf base), and its long, slender, bristle-like leaf tip (Webb et al., 1996). This species has been recorded in Fermanagh, Armagh and Down. Specific sites include Magheraveely Marl Lakes and Drumcritten Lough, both in County Fermanagh, plus Quoile Pondage, Greenan Lough and Rostrevor Forest Nature Reserve in County Down, and Peatlands Park in County Armagh. G. palustre and G. uliginosum occur in generally similar wetland situations and they can occur together, although fen bedstraw is characteristic of and more or less confined to base-rich or calcareous sites that are permanently wet at the surface, but that have little or no standing water in the summer (Hancock, 1942). It thus occupies rather drier ground than does G. palustre. Fen bedstraw appears in lowland wet marshy grasslands or tall herb fens around a few of our lakes, but it also occurs more rarely in lime-rich flushed ground in more upland moorland pastures, even when these form part of tussocky acid bogland. Fen bedstraw flowers from June to August. Relevant access permissions should always be sought prior to visiting any sites. G. uliginosum is found mainly in the central belt of Ireland, from north Galway and south Clare eastwards. It is absent from the more acidic terrain lying to the south of this belt, and from most of the north of the island. 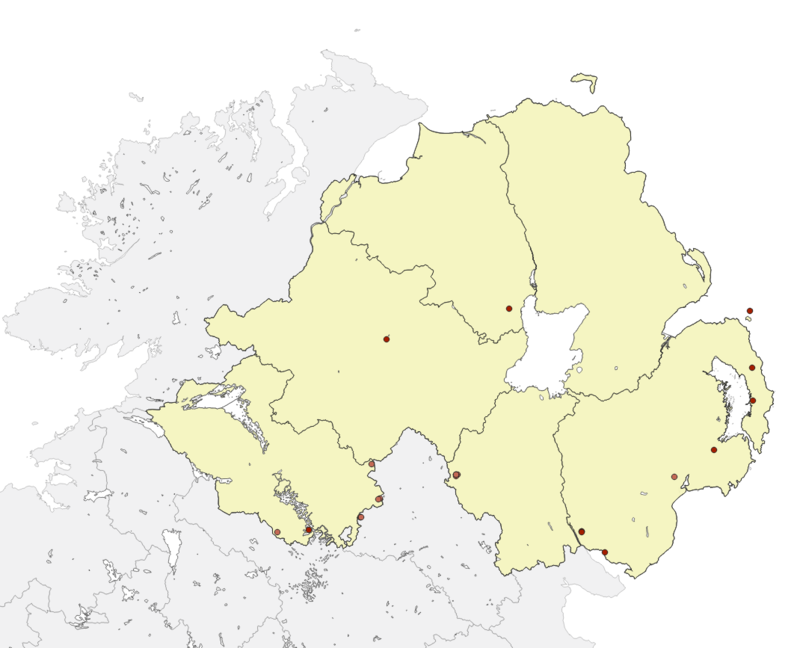 Even within Northern Ireland, almost all the reported sites where G. uliginosum has been reported lie on or close to the southern margins of the three county boundaries (Webb et al., 1996; Preston et al., 2002). While the CEDaR Centre Vascular Plant Database contains records from four sites in Fermanagh, three in Armagh and nine in Down only two of the Fermanagh records are supported by voucher specimens. All of the other records must be approached with caution until they are equally validated. The sudden rash of these sixteen post-1980 records for fen bedstraw in Northern Ireland is not considered to represent a real increase in the distribution of this species. Rather it merely indicates that G. uliginosum had been easily overlooked until the advent of a systematic and prolonged botanical survey, that is, the BSBI Atlas 2000 flora recording project. Although G. uliginosum appears scarce throughout Ireland, there is a good chance that it remains under-recorded, at least to some extent. In Northern Ireland the species is scarce and has declined. Drainage and pollution, particularly nutrient enrichment from agricultural run-off, are the major problems facing this and many other wetland species. Several of the sites where G. uliginosum grows in Northern Ireland are designated on account of their conservation importance as ASSIs, for example, Drumcritten Lough, Quoile, Greenan Lough, Rostrevor Wood and Peatlands Park. The status of fen bedstraw will be surveyed and monitored and appropriate conservation action undertaken if required. Records of new sites and estimates or counts of the sizes of populations are always valuable. If you think you may have found it, do photograph the plant. Send information to The Botanical Society of the British Isles, c/o Department of Botany, National Museums Northern Ireland, 153 Bangor Road, Cultra, Co. Down, BT18 0EU or to CEDaR, National Museums Northern Ireland, 153 Bangor Road, Cultra, Co. Down, BT18 0EU. Tel: 028 9039 5256, email cedar.info [at] nmni.com. Grime, J.P., Hodgson, J.G. and Hunt, R. (1988). Comparative Plant Ecology. Unwin Hyman, London. Hancock, B.L. (1942). Cytological and ecological notes on some species of Galium L. EM. Scop. New Phytologist 41: 70-78. Preston, C.D., Pearman, D.A. and Dines, T.D. (2002). New Atlas of the British & Irish Flora. Oxford University Press, Oxford. Ridley, H.N. (1930). The dispersal of plants throughout the world. Reeve & Co. Ltd., Ashford, Kent. Scannell, M.J.P. and Synnott, D.M. (1987). Census Catalogue of the Flora of Ireland. Stationery Office, Dublin. Stace, C.A. (1997). New Flora of the British Isles. 2nd edition. Cambridge University Press, Cambridge. Webb, D.A., Parnell, J. and Doogue, D. (1996). An Irish Flora. 7th revised edition Dundalgan Press Ltd., Dundalk.